These cards were designed and printed for a small New Zealand based business which makes and sells beautiful handmade goods. The pure white colour scheme has a fresh and uncluttered feel which makes use of texture and depth for a tangible effect. 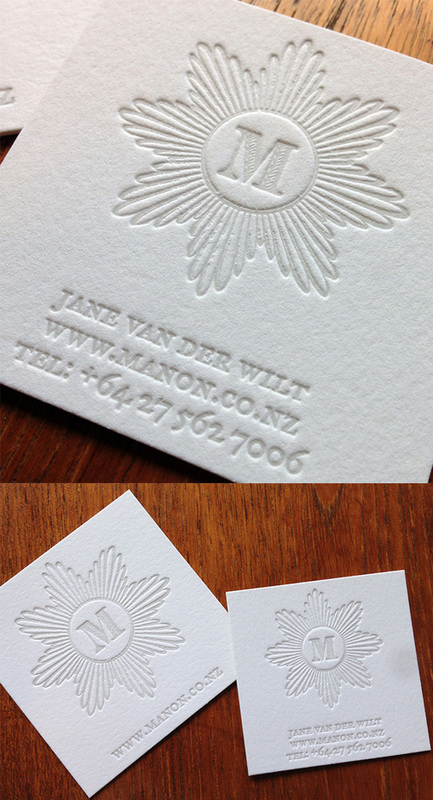 The logo and text have been pressed deeply into the thick card stock to create a deep impression with an embossed look. In this case, because the design has been pressed into the surface it is known correctly as debossing (an embossed design would appear raised in relation to the surface of the paper). With a white on white design such as this the image is usually blind pressed, meaning that the printing plate has no ink on it and it is just the impression from the plate which shows up. Here, a clever printing trick has been used where a very pale tint of ink has been used on the plate instead of blind pressing. This serves to pick out the image more clearly whilst still maintaining the aesthetics of the blind press process.